A gift for my customer's brother. 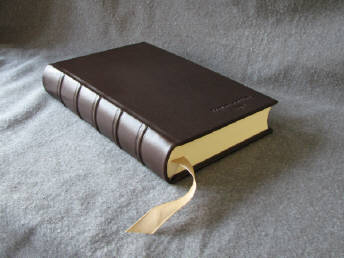 A journal with unlined blank pages bound in dark brown goatskin leather with raised cords on the spine. 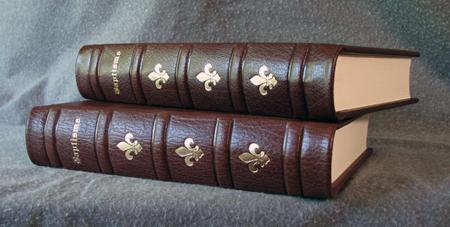 A classic binding that lets the beautiful leather shine. Made for a talented artist friend, I wanted something that showcased the beautiful leather on the cover and had an arts and crafts feel. 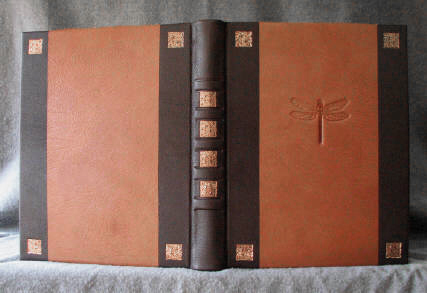 The square cetlic knots help accompish this as does the blind-stamped dragonfly on the front cover (a motif that is often found on arts and crafts style pieces). 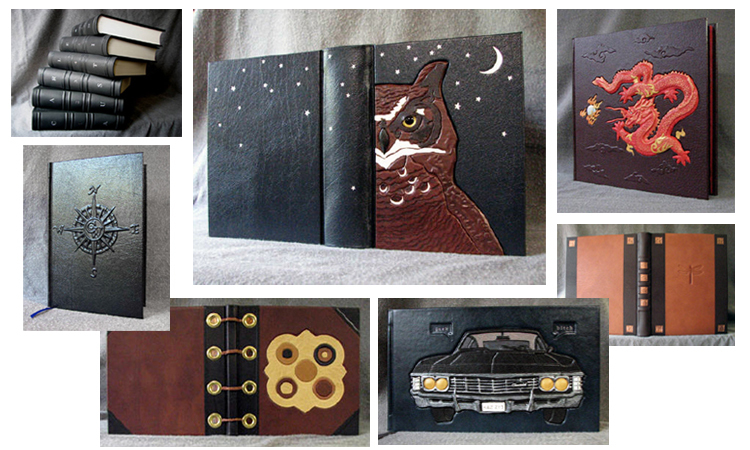 My customer wanted me to make this book for a friend who had plans to write a novel. This book was meant to hold the first, hand-written version of that novel. 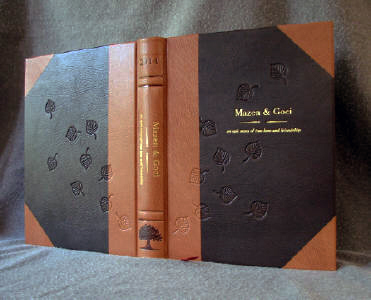 The book has blank pages, a printed title page, and a very traditional 1/4 binding (where the spine is made of a different material than the front and back covers). Clean and classic, it's the perfect look for that novel. 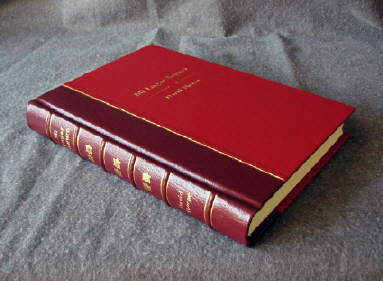 The traditional 6" wide by 9" tall dimensions of a "novel-sized" book were altered slightly here to give the book a slightly taller, narrower, more "Gothic" feel. a little additional detail was added to the front and back covers by creating raised panels that gives the edges of the covers a nice "matted" look. 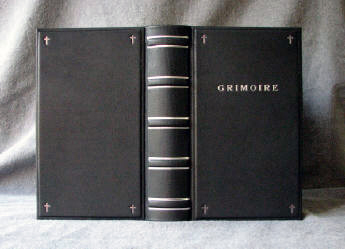 This book also has very traditional raised cords on the wide spine outlined in silver foil. Small crosses are stamped in the corners of the front and back covers in pewter foil. Sometimes, you just want to enjoy the beautiful leather on a cover and not have anything to distract from it. 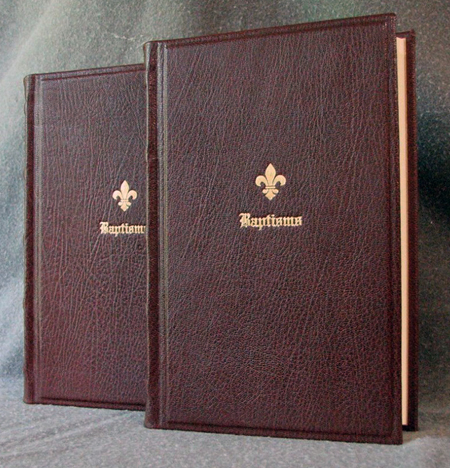 This set of three very traditional volumes have plenty of pages for writing and beautiful goatskin leather covers. 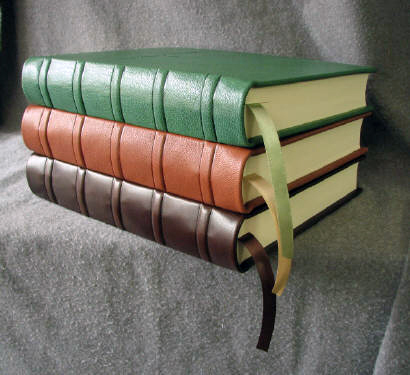 They have complimentary ribbon page markers, marbled paper endpapers, traditional raised cords on the spine, and blind stamped titles on the front. Traditional with a little extra...a very classic goatskin leather cover with raised panels on the front and back. 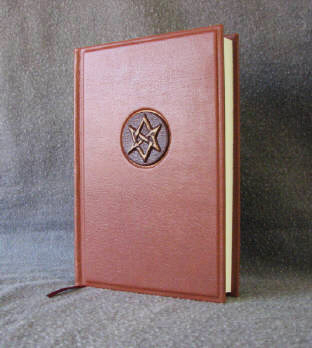 This book has the addition of an Aquarian star, carved from a separate piece of binder's board covered in hand-pared dark brown goatskin leather, accented with gold pigment, and attached to the cover in a slightly recessed circle. 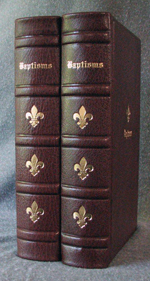 The spine has raised bands with a blind stamped art deco design imprinted on the bands. This book was created for a couple to write about the milestones in their relationship over their lifetime. My customer had some specific requests including that he wanted the blowing leaves to go across the front and back covers as if they were emanating from the tree at the bottom of the spine. This book has many classic elements (the 3/4 binding and the raised cords on the spine) but also has a modern look with the leaves scattered across the covers and the spine. This set of very traditional bindings will act as baptism record books for a church for decades. My customer wanted a very rich look so I used a very rich and luxurious goatskin leather and actual 22 karat gold foil stamping. 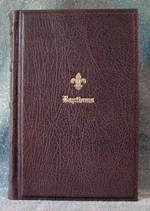 A fleur-de-lis die was ordered for the cover stamping and very traditional (if slightly hard-to-read) Olde English type was used for the front cover and spine lettering. 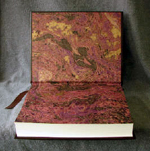 My customer also requested endpapers that looked like "wrinkled gold" and I searched until I found some. He was also very specific about the page size and lined pages were custom printed in a 6" wide by 9" tall size for this project.